Follow it without losing your way. There lies the 'answer' that you seek. I race to the dojo, using every ounce of speed that I possess. Please...Please don't let anything happen to Kaoru. He laughs hysterically, the aura of his madness clear for everyone to see. "Grieve! Scream! Mourn! And then die weeping!!" "Look carefully with your eyes!" "Kaoru-dono!!" I scream desperately. It was strange how I could barely recognize my own voice but I needed a reassurance. I needed her to tell me that she was alright. That she was fine. That I shouldn't worry because she was perfectly well and alive. My footsteps hastened as I caught sight of the door. Why wasn't Kaoru answering? Why wasn't she saying anything?! The sword slips from my grip. "Kao...ru...-dono..."
My mouth moved slowly, calling her name like a broken record moaning repeatedly. Eyes roving - tracing the scar engraved on her face in morbid fascination, I look on. Staring at the image of my deepest most darkest nightmare brought into a reality - Kaoru slumped, bleeding, lifeless eyes staring accusingly back, her body mercilessly impaled by his sword on the dojo wall. My knees buckled, I fell to the floor. 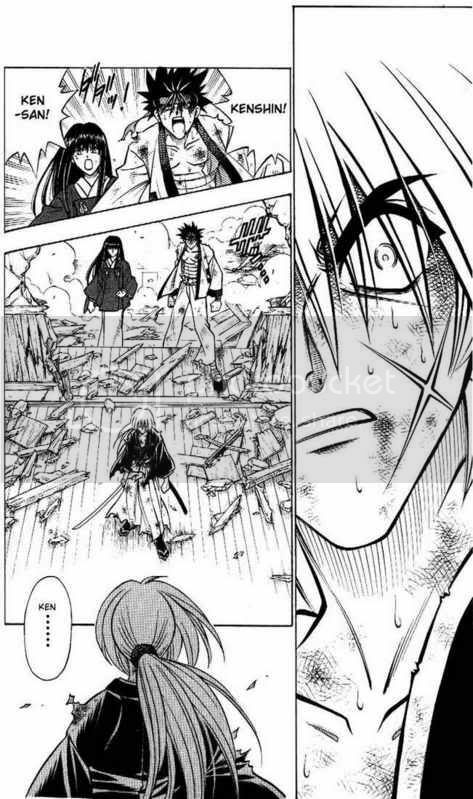 "What good is Hiten Mitsurugi Ryuu..."
"What good is Himura Kenshin...Again, I failed to protect the one who is most important to me..."
My eyes stung, tears forming as I tightly shut my lids. Feeling the sensation of a loss so great ripping through me - whole chest crumpling, constricting. I couldn't heave enough air. OOC: Chiiii~~ in depth character study of the ex-hitokiri. Eyes threatening to alight gold, I held in the urge and snapped open the hilt of my sakabatou. The pain came with the memories as the white-haired man turned to me. Tomoe. That day on the fields. And a small black haired boy glaring daggers in my back out of jealousy. Banishing the thought away, my eyes narrowed observing the two of them. I didn't want to hurt Enishi. I didn't want to hurt someone Tomoe loved. But if I were to be made to choose between the memory of Tomoe and that of Kaoru. Calloused hands tightened on the saya. Hello, Sessha's real name is Himura Kenshin. I used to be a former anti-Shogunate assassin that went by the alias Hitokiri Battousai. Back during that bloody revolution it was my late wife Tomoe Yukishiro who saved me by allowing me to see the error of my ways. I have adopted the title of Rurouni and wandered endlessly after her death until I came across a vibrant woman named Kamiya Kaoru a kenjutsu instructor for the Kamiya dojo. This one was very surprised at first but chose to accept her offer to stay. I will be frank. I have tired of my wandering ways and there was something about Kaoru-dono that calms me like none I have encountered before. And so, I chose to stay. I can only hope that this small semblance of peace lasts for a little bit more. I know I'm being hunted. I know I will never be truly free from my bloody title. But I will do my best to prolong this moment. And when, not if because they will surely come, to threaten this piece of serenity that I have. I will wield my sword again and use it to protect her. Protect Kaoru-dono. Because whatever it takes, no matter how hard it is to achieve...I will protect her happiness and make sure she never stops smiling. Even if I have to kill to do it, I would...for her. For her and her never ending smiles.